The Preserve consists primarily of vegetative attributes of the Mojave Desert but contains floral species of the Great Basin, Sonoran and even some elements of the California Chaparral Zone. Many plant species are distributed only within its boundaries; while other areas such as the New York Mountains contain species of manzanita, California lilac, oak, and silk tassel, which are normally associated with coastal California. The Mid Hills have significant stands of Great Basin sagebrush and Utah juniper. The strongest association however, is with the Sonoran Desert, whose northernmost range is often recognized to intermingle with the southern border of the park. Sonoran plant species such as pancake prickly pear and smoke tree are found extending a dozen or more miles into the southeast portion of Mojave National Preserve. Community types common elsewhere in the desert and also present within the Preserve are the playas, saltbush, creosote-covered flats and alluvial fans, and Joshua tree woodlands. There are also many important unique or rare habitats within the Mojave. The Preserve is unusual in the complexity and density of the Joshua tree community, which is represented on Cima Dome. The quality and sheer vastness of the Joshua tree forest on Cima Dome is unparalleled anywhere in the world. 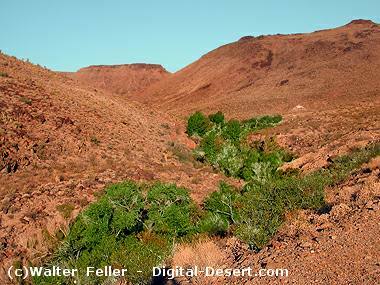 There are seven different types of wash plant species associations including catclaw acacia, smoke trees, and desert willows. Higher elevations support grassland, sagebrush, blackbrush, pinyon-juniper woodlands as well as unique remnant habitats containing small white fir forests, and pinyon-junipers with oak. 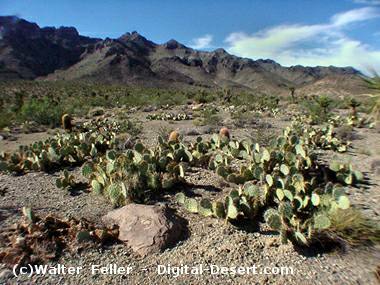 The Piute Creek desert oasis also supports a very fragile and limited community. A total of 803 species of plants representing 85 plant families have been identified in the Preserve (Thomas, 1999).